uses discussions and analogies to help members understand one’s own values and the values and principles of JCI, the role of all members in establishing the Local Organization’s identity, the activities needed to fulfill the JCI Mission and develop JCI members into active citizens who will create positive change in their communities. a half-day course and should be taken by all new members who want to fully understand the principles, meaning, purpose and dynamics of a JCI Local Organization. a course aimed for JCI members who want to become active citizens and create long-lasting positive change in their communities. The course discusses the active citizenship concept, covers the analysis of community needs, solutions addressing these needs and discusses the projects a Local Organization can conduct with all sectors of society in order to create sustainable and effective positive change in their community. is the JCI Local Organization management course recommended for any member who wants to become a member of the local board or a leader at any level in the Local Organization. The course covers the structure of the local board, management of the Local Organization affairs and the responsibility of the Local Organization in providing development opportunities that will empower JCI members to create positive change in and outside of JCI. is the JCI course on turning your personal contacts into lasting, trusted and productive connections and relationships. The course covers the principles and dynamics of networking, how to identify and use the opportunities when contacting people, the follow up actions needed after meeting the person to keep adding value to the connection and how to use the participation in JCI activities to build a reputation that will establish a network of connections for the future. 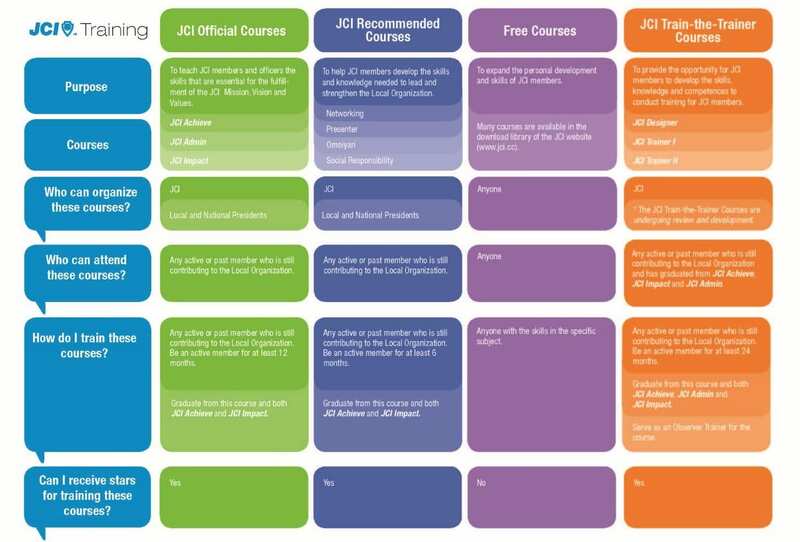 the JCI Effective Presentation Course is a full day course that focuses on the concepts of creating and delivering an effective presentation utilizing visual aids and strong delivery methods with a mind towards understanding the audience. Participants practice presentations during the entire course.